An interim investigation report raises more troubling questions than it answers. Australian investigators are now looking at cosmic rays as the possible source of an in-flight upset of a Qantas A330, having ruled out interference from a ground-based radio station, but they have not explored why the failure of a single computer component was not over-ridden by a supposedly redundant flight control system, and they have ignored one of the primary shortcomings of aircraft seatbelts that contributed to some of the injuries. The case involves a Qantas fly-by-wire A330 on a 7 October 2008 flight from Singapore to Perth with 342 passengers and crew aboard. The aircraft, at 37,000 feet, flew near the Harold Holt Naval Communications Station on the northwest coast of Australia, and electromagnetic interference from the facility’s powerful antennas was initially suspected as the cause of the sudden pitch down of the aircraft. However, testing has ruled out this scenario and investigators are now looking at possible cosmic ray interference. Supposedly, cosmic rays resulted in a false reading of high angle-of-attack on one of three air data inertial reference units (ADIRU’s) that resulted in a pitch-down of the nose in two phases, the first more dramatically, that together resulted in a loss of 700 feet in altitude. One flight attendant and 11 passengers were seriously injured, while 107 other passengers and crew received minor injuries in the sudden pitch-down. The cockpit crew declared MAYDAY and the aircraft diverted to the Royal Australian Air Force base at Learmonth, near Exmouth, western Australia, to obtain medical attention for the injured. 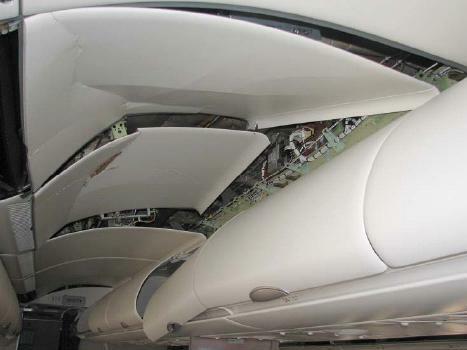 Damage to overhead ceiling panels as a result of the sudden pitch down. 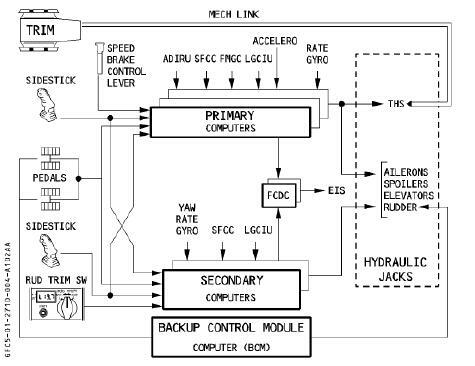 Schematic of the A330 flight control system; note that three ADIRUs feed to the primary computers but that anomalous 'spikes' still got through. One might say this is all very interesting but beside the point. Any component may fail, and the Airbus A330 is equipped with three ADIRUs. A failure of a single component, whether caused by cosmic rays or some other source, should not lead to near-catastrophic results. The computer should have been able to detect an ADIRU disagree and identify the bad data, or, if not possible, to just discard the angle-of-attack data altogether. Of course, such selectivity would not be the case in an event like the crash of the Air France A330, where it is suspected that all three Thales model pitot heads suffered the same internal icing malady – thereby overcoming the protections provided by triple redundancy. “In my experience, when a computer goes into the doze mode [described in the ATSB report as one where the ADIRU “stops outputting data for the remainder of the flight.”] and has to be rebooted, either the hardware failed, something in the software did other than what the programmer intended, or the system design failed to take into account all the possible consequences of all the programmers’ different intentions. 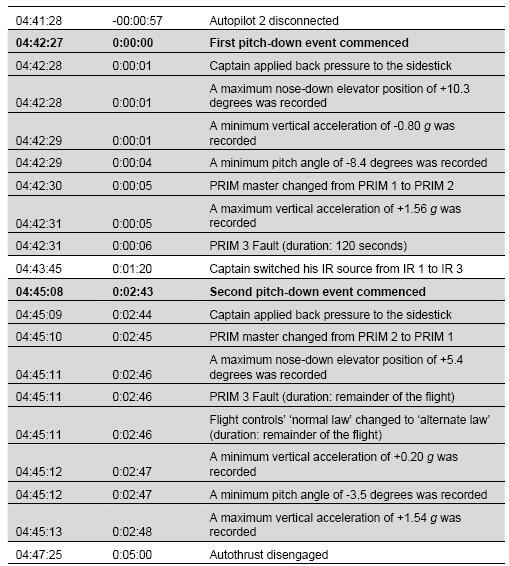 The upset sequence as captured on the flight data recorder (FDR). What happened, if it’s to be dismissed as caused by cosmic rays, is simply unacceptable. The virtue of redundancy is supposedly protection from erroneous data on one channel. So the question isn’t so much what caused the glitch in the one ADIRU, but how this error got through the voting of the other ADIRUs and caused the in-flight upset. The integrity of the avionics shielding is also a subject of concern, given that a rogue neutron got through to cause the glitch. There is another aspect of the case, quite separate from avionics reliability, that bears comment. That is in regard to the seat belt buckles, and some of them popping open. According to the ATSB, based on questionnaires returned from the flight’s passengers, of 147 seated at the time of the incident, 87 were wearing their seatbelts and 60 were not. Passengers wearing seatbelts received a significantly lower injury rate than those not wearing seatbelts, 36% compared to 92%. “Six passengers reported to the ATSB that they were seated with their seatbelt fastened at the time of the first upset, but that the seatbelt became unfastened and did not restrain them in their seats. Three of those passengers advised that they had their seatbelts lightly fastened, and three advised that they had their seatbelts loosely fastened. None of the six passengers could provide details of how their seatbelts released. 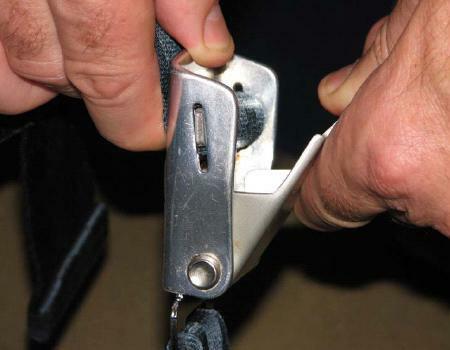 In other accidents and incidents, passengers have reported that the buckle was wedged in such a manner they could not pull on the lift-latch and release themselves from the seat. One woman told U.S. investigators she kept pushing on the buckle, as if it were the push-button release mechanism found on her auto seat belts. So the older lift-latch model has two problems: it can release when the belt still has protective work to do, and it will not release when wedged between the passenger and the seat, or when the passenger is dazed and confused. One wonders why the aircraft industry hews to an outmoded design when the automobile industry years ago went from the lift-latch to the push-button release. The push-button design is immune to becoming uncoupled when in contact with the armrest or other structure, and people are familiar with how to release the buckle. The orange pushbutton design should be incorporated on all passenger jets. To receive a safety briefing on a 50-year old seatbelt latching mechanism shows how the industry invests in technology to increase fuel efficiency by a fraction of a percentage point while it puts passengers at unnecessary risk with obsolete, unsafe seatbelt design. The larger question, though, is yet to be answered: How could an ADIRU failure make its way through to the flight control surfaces?